So, you may have heard: the economy is tanking. According to retailers, we’re spending less on gifts this holiday season than we did last year. We’re taking vacations at home. We’re economising on everything from groceries to toiletries, and people are learning how to darn socks again, bake from scratch again, or wash their own cars. Everybody’s worried about finances or being laid off. What to do? Okay, not really. That would just be silly (and totally uneconcomical). Not to mention slightly gooey, a bit slimy, way too salty, and overall, yucky. Of course you shouldn’t eat real caviar. 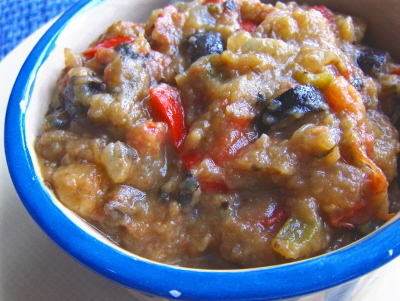 I’m talking about eggplant caviar! I first enountered a recipe for this economical dip many years ago in one of The CFO’s Bon Appetitmagazines, and was intrigued as soon as I scanned the ingredient list. Then, once I finally I tasted it, I was totally enchanted. 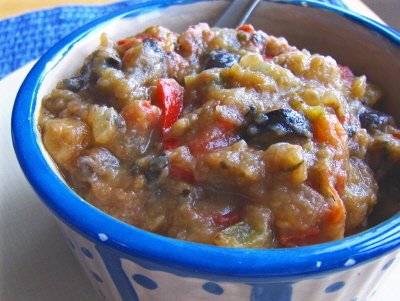 The blend of piquant balsamic with the moist, slightly chunky eggplant and sweet pepper was remarkably delicious. I ended up eating half of that first batch straight off a spoon, crackers be damned! (Well, since I was emulating a rich person by eating “caviar,” I figured I could be as eccentric as I wished). This recipe is adapted from both this one and this, and I added another twist by tossing in some chopped olives (the salty, black chunks were the only similarity to actual caviar in the entire dish). Have this on crackers, or spooned along the crease of a celery stalk. I haven’t tried it yet, but I bet it would even be great tossed with freshly cooked penne. I made this last week, using two eggplants I bought in the “gently damaged” shelf of the produce section at our local supermarket (ie, the half price shelf). It was a great way to feel both frugal and rich–all at the same time. Now I must get to work on those holes in my socks. I’m also contributing this to Suganya’s “Vegan Ventures, Round 2” event, requesting a favorite vegan recipe. How could I not submit this–I mean, it’s caviar, right? Actually, I could never really understand why they called this “caviar,” as, to my mind, it neither resembles nor tastes like its namesake. In any case, though, it’s a wonderful and tasty dip or spread, and economical, too. Preheat oven to 375 F (190 C). Line a cookie sheet with parchment paper or spray with nonstick spary. Cut the eggplants in half lengthwise and place cut side down on the cookie sheet. Pierce the skin a few times with the tip of a knife. Bake in preheated oven about 45 minutes, until completely soft. Allow to cool. Meanwhile, heat the olive oil over medium heat in a large skillet. Add the onion, garlic and pepper, and sauté for about 5 minutes, until softened. Add the tomatoes and olives, and heat through. Remove from heat. Scrape the flesh of the cooled eggplant in a large bowl, and mash with a fork or potato masher (or pulse in the bowl of a food processor, just enough to break it up without puréeing). Add the cooked onion mixture, along with the vinegar, salt and pepper. Adjust seasonings. Store covered in the refrigerator, but eat at room temperature. This tastes better the second day, as flavors meld. Makes about 2 cups. Strange! It looks great, but definitely not like caviar. Good holiday dip idea though! Yummy! Don’t really get the caviar part of the name – maybe it’s to make people feel like it’s special and rare or something? Why anyone would eat fish eggs is beyond me…eggplants on the other hand – LOVE EM! Thanks for all the blog love, Ricki. Tu es une vraie amie! Mmm, I love eggplant! I was just going to buy some but I didn’t have a recipe…dang now I will have to go bsck! p.s. your package should be arriving sometime this week. I would have eaten all of it by myself too. Anything with eggplant and olives is okay in my book! Mmmm I have a recipe very similar to this. Thanks for reminding me I need to make it again; it’s been too long. I can’t say “caviar” was the first thing that came to mind when I saw this, but it definitely looks good no matter what you call it! I’ve always been intrigued by eggplant caviar, but have never tried it. The name is baffling! I think I’ll give this recipe a try next time I have eggplant to use. Thanks! Yep. Nothin’ wrong with gooey and slimey according my Poppy either. Ya know, the new camera? Working a TREAT, I tell you. Beautiful and seductive images. Awesome! I can definitely picture this deliciousness tossed with some penne. I’m with Lucy, your new camera takes GORGEOUS pictures! I tried the “caviar” tonight. Unfortunately, I burned the bloody hell out of the eggplant, but I still scraped some meat off those buggers. I like it. Mmmm, eggplant – looks yummy! Sounds delicious Ricki, something like a ratatouille dip, maybe. All this talk of stay-at-home-hols and make-do-and-mend makes me chuckle as it’s pretty much what I’ve been practising the last twenty-odd years! I agree there’s something fishy about the name, but I’ve always loved eggplant caviar — and Texas caviar, which is made with black-eyed peas. Whatever you call it, your recipe looks delish. Oh, it looks sooooo good! I’m still learning to love eggplant. I think I could like this totally melted caviar version. Yum! Eggplant is soooooo amazing… and versatile.. I love this.. I have looked all over for this recipe. I used to make this years ago. Just bought some lovely organic locally grown eggplant and can’t wait to make this version. I stumbled upon your website while doing a Google search to see if figs were poisonous for dogs (I am also a huge canine fan and my little girl is our furkid). This cute little furkid ate part of a fig and she liked it. Then I panicked to think i may have given her something that was bad for her. So happy I found your site. It is a favorite. And, I will definitely get a copy of your cookbook! This recipe is right down my alley! I have all the ingredients in the fridge right now. I am so having this tonight. Your site is amazing, thanks.